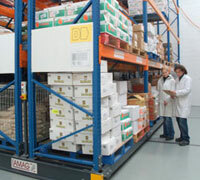 Leading Food Wholesaler Le Gourment chooses Euromech Mobile Pallet Racking. Le Gourmet Wholefoods was established in 1967, the first importer and distributor of quality dried and ethnic foodstuffs in Ireland. The company recently expanded to new, custom-built premises located just off Dublin’s M50 motorway giving it the capacity to meet the future demands of both bulk and catering customers. 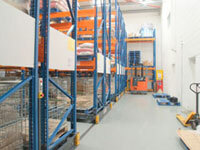 The new premises were built to the company’s own specification which included a requirement for a pallet racking system that would not only maximise the amount of available space in the warehouse, but still allow for both forklift and handpicking operations. Le Gourmet decided that the only way to meet these varied requirements was to switch from fixed, conventional racking, to a mobile rack system that would offer increased flexibility in its warehouse operation. Euromech was commissioned to design, engineer and install a mobile pallet racking system that more than doubled the amount of available pallet spaces when compared to conventional pallet racking. Aisles are operated electronically from a central console, speeding up productivity by opening aisles while the forklift approaches. Each pallet location is bar coded and linked directly to the company’s own telesales system giving Le Gourmet an efficient and extremely streamlined ordering and stock replenishment management system with real-time inventory checks and “zero failure” picking. Safety is an integral part of the system, with infrared light barriers located at the end of each aisle. Rack movement is stopped as soon as the barrier is broken. For out-of-hours stock management, the electronic control system also includes a “night-park position” whereby the racks are individually separated, ensuring proper circulation of air throughout the goods. 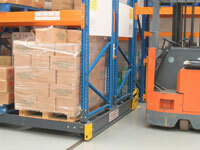 This setting also facilitates efficient order picking and stock checking during the day.